Posted July 22, 2016 by Jen & filed under Food. A little backstory: my sister is vegan and is currently visiting us from out of town. We all decided to embark on a 30-day vegan challenge to make her feel more welcome and to make cooking meals less cumbersome. I mean, we also had our own individual reasons for trying this out too. For me, it was about health. I had fallen into some not-so-healthy eating habits as of late and had hoped the challenge could help reset my habit and improve my discipline. Plus, reducing meat consumption (whether it be going full vegetarian/vegan, or even just one day a week) helps to lower our environmental impact and is much more sustainable. Cheese is the one thing that doesn’t have a very good vegan alternative. Vegan cheeses that are available in the stores are not good. It’s the texture. They are always just… off. 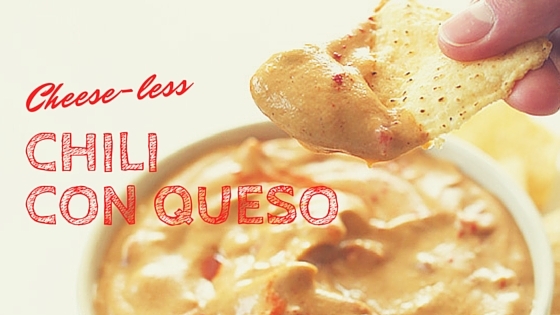 So I was excited when I found this vegan queso recipe on Minimalist Baker (who I love, by the way. Always great recipes). It is brilliant. They were bang on with the texture. Velvety, smooth and creamy. And it’s not as calorie dense as nut-based cheese (or even real cheese for that matter). The secret ingredient: eggplant. That’s right! The creaminess of the roasted eggplant lends so well to the dip without adding any overpowering vegetable flavour. No one could tell that there was any ounce of vegetable anywhere in it. It was a huge hit! Dip with tortilla chips or (unconventionally) drizzle over sofritas veggie bowls. All aboard the train to Yum-Town! Try the recipe at Minimalist Baker.